About a month ago I posted my influence map, and ran a scavenger hunt competition to name all my influences. Enough people had fun with this that I have decided to make a similar regular feature. So witness the birth of "Art History Scavenger Hunt", each month (or so) I will post a visual riddle and the first person to post in the comments with the correct answer wins a prize. This months prize will be a free copy of the Dead Reign RPG core book from Palladium Books signed with a sketch. Please be patient with the prize, I just mailed out last months today. Here is the hunt for October (see what I did there). 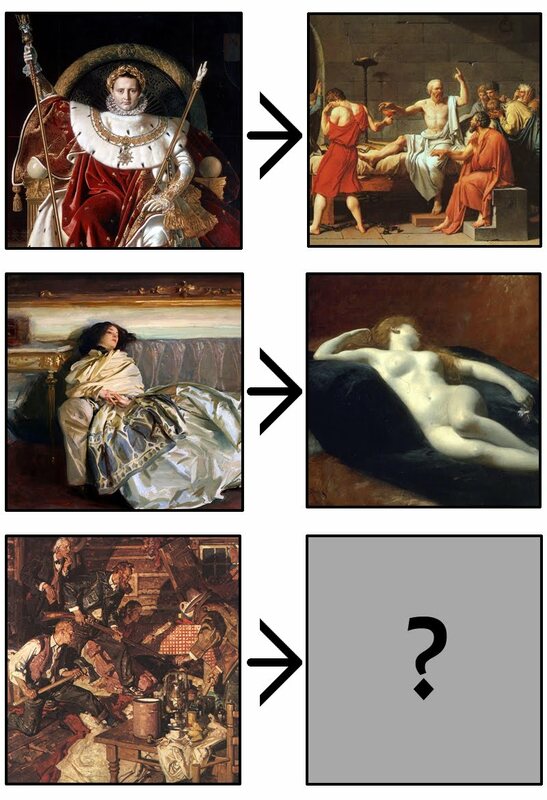 Name each of the artist's responsible for the paintings below, as well as the mystery artist that continues the pattern. The only thing that puzzles me is the pattern. I believe David was Ingres' teacher, which is confusing me. You could flip it around and then Harvey Dunn would be Cornwell's teacher. I dunno - did I mess this up? Okay- I will send a signed sketched copy to both Scott and Kurt. Bonus points to Kurt for giving both acceptable answers. If both you gents would email me your address I will get them in the mail in the next couple weeks. Scott if you want to wait till IlluxCon let me know. I don't think it was the lack of knowledge- just my basic lack of puzzle solving! Back to Pre-K for me. I gave it to you as well, because you had all the info correct. I probably wouldn't have if you hadn't included that last sentence, and if you weren't such a damn nice guy. IlluXCon it is. Dunn taught Cornwell so Cornwell would be continuing his Dunns Legacy which of course comes from Pyle.